You can install software that you download from the web or from a CD or DVD for use on the Windows 10 desktop. (Windows 10 apps must be installed through the Microsoft Store.) 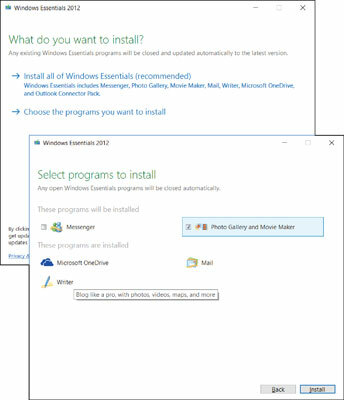 In this set of steps, you install Windows Photo Gallery, a free program for editing photos. To install Photo Gallery, open your browser and enter get.live.com in the address bar. You land on the web page for downloading Windows Essentials (if your browser doesn’t take you to this page, go to support.microsoft.com and search for Windows Essentials there). If a website offers to install a program automatically, look at that suggestion with suspicion. It may be legitimate or it may be malevolent. Decline downloads from sources that you don’t know and trust already. Select the Other Download Options link under the Get It Now button. On the Windows Essentials Download Options web page, scroll to and select the English (United States) link (or select the link that describes your favorite language). In the dialog box that asks you whether to save the file, select Save. Your browser displays a message at the bottom of the browser window, as shown. Select the Run button. If the User Account Control dialog box appears, select the Yes button to indicate that you want to download and install the program. The Windows Essentials screen appears, as shown at the top of the figure. Select Choose the Programs You Want to Install. On the Select Programs to Install screen, deselect everything except Photo Gallery and Movie Maker (one option), as shown at the bottom of the figure. Then select Install. Generally, if the installer for a program offers Express or Custom installation options, choose the Express option to let the installer set up the program without further input from you. The Custom or Advanced Settings option allows you to specify where to install the program and, perhaps, which parts of the program to install. A moving bar indicates the progress of the installation, which should take a few minutes. On the screen that indicates installation is done, select the Close button. Many programs try to connect to the Internet for updates during installation or when you run the installed program. The first time you run a program, you may be asked whether you want to register the program or configure some aspect of the program. Go with the default (assumed) responses, if you’re not sure. As does the Photo app, Photo Gallery displays photos from your Photo Library.